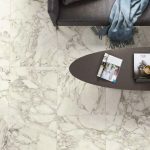 The IM Series is a faux marble porcelain tile from Italy. It features a variating design to simulate the natural variations found in marble, but offers the ease of maintenance inherent of a porcelain tile. It is available in 2 colors: Arabesque White and Sahara Noir. 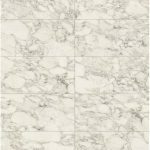 Arabesque White is offered 3 sizes: 12″ x 24″, 2″ x 2″ mosaic, and a 47″ x 94.5″ panel. 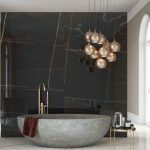 Sahara Noir is offered in a 2″ x 2″ mosaic and a 47″ x 94.5″ panel.